Brook: I Was Beating Spence, But My Eye Went - At 100% I'd Win! On Saturday night at AT&T Stadium in Arlington, Texas, Errol Spence dominated four division world champion Mikey Garcia to retain the IBF welterweight title. It was the third world title defense for Spence, since capturing the world title with a knockout win over Kell Brook in Sheffield. Spence put away Brook in a competitive fight, when he fractured the Sheffield boxer's eye socket in the eleventh round. Brook, 32-years-old, has now undergone surgery on both his eye sockets, believes he can still operate at the highest level and would welcome a rematch with Spence. 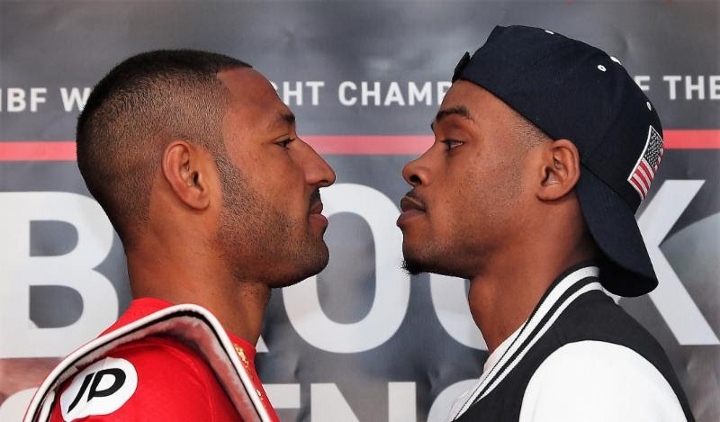 Brook believes that he was winning the fight with Spence, prior to getting stopped. He's been pushing for a rematch and believes that he'd win - if his body is 100% healthy for the bout. "I'm brand new, I'm ready for those massive fights," said Brook to Sky Sports. "I've got plenty more to give for the fans. I'm excited about these big fights. "I believe he [Spence Jr] dominated the fight. That fight is still there. He still mentions my name, he still would like to fight me, because he knows I was beating him. "The people around me know what my training camp was like for that fight. I was far from 100 percent, and I was beating him, and the eye went. I would love that fight again. "A 100 percent me, beats Errol Spence, and he's one of the biggest names in boxing. I think those fights are still there to be made." As reported earlier on BoxingScene.com, Brook is planning to fight again on June 1, as part of the Anthony Joshua vs. Jarrell Miller undercard from Madison Square Garden in New York City. Spence is planning to return in the summer months. He hopes to face eight division champion Manny Pacquiao or WBC welterweight champ Shawn Porter. Kell The Bum Slayer Brook clout chasing for relevance right before he fights another bum hoping it's enough to get his daddy Khan into the ring with him. Stick to fighting bums. That eye injury was INFLICTED. Dumbass. They were level going up to round 7 and Spence took over the fight. I'd watch it again but Kell's last showing has me wondering if he's starting, just starting to be on the slide.